Sam Pluta focuses on combining instruments and electronics, mixing their worlds into new sonic spaces. He has composed for Wet Ink Ensemble, Yarn/Wire, Timetable Percussion, Mivos Quartet, ICE, Dave Eggars, and So Percussion. 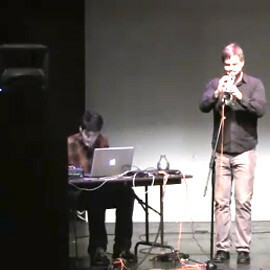 As the Technical Director of Wet Ink Ensemble, dedicated to playing new music by young composers, he has begun touring. He has a PhD from Columbia and masters degrees from UT Austin and BEAST in the UK. Sam runs the electronic music studio at the Manhattan School of Music and teaches there, at the Walden School and Columbia.